Havis Amanda was completed and cast in bronze in Paris in 1906. It is a fountain with a female figure rising above it. It's unveiling ceremony took place on 20th September 1908 in Helsinki's main market place. According to the sculptor of this work, Ville Vallgren (1855-1940), the French were also interested in acquiring the sculpture for a location in Paris but Vallgren insisted that it was commissoned by the City of Helsinki. Havis Amanda fountain belongs to Vallgren's charming Parisian art nouveau works, characterised by subtle and skilful forms. Although it is a monumental work, it shares the delicateness of Vallgren's smaller sculptures. 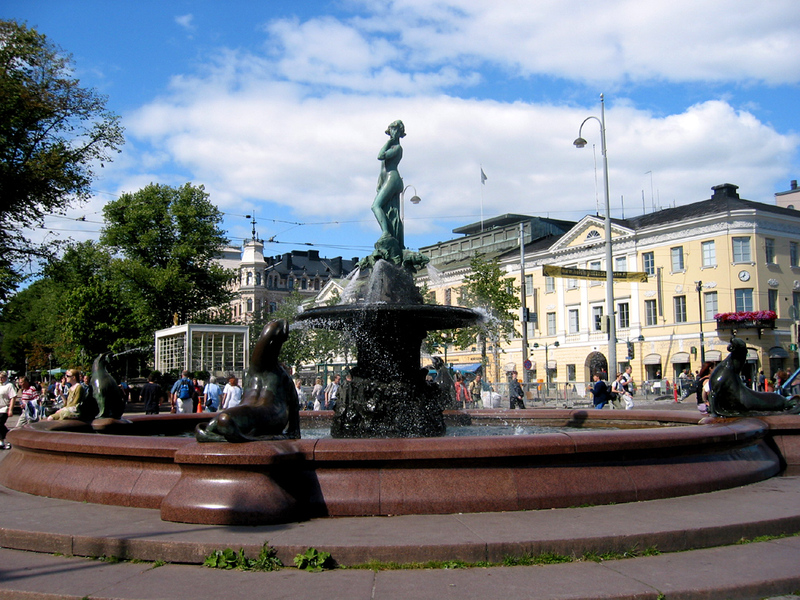 According to Vallgren the central female figure, who has risen from the sea, symbolises Helsinki and the birth of the City. Upon her unveiling the Swedish language newspapers in Helsinki and the sculptor himself started to call the sculpture 'Havis Amanda'. The fountain also includes four sea lions and water-spouting fish amid the swaying seaweed at Havis Amanda's feet. The sculpture is, for the most part, cast in bronze and stands on pink granite from Vehmaa. The work in total measures five metres in height. Ville Vallgren lived and worked in Paris as he planned his 'fountain sculptures' for Helsinki. A young 19-year old Parisian lady, Marcelle Delquini, is likely to have modelled for Havis Amanda. According to Vallgren's letter to the association of Porvoo Museum in 1906, another 19-year old Mademoiselle, Leonie Tavier, has modelled for the Little Havis Amanda now situated in the Porvoo Museum. Initially, maiden¿s nakedness and seductiveness were considered inappropriate and the monument was strongly criticised, especially by women. However, it gradually won people's favour and, as a consequence, has been the centre of innumerable celebrations and merrymaking for decades. The biggest of these celebrations is Vappu. Vappu parties and rituals take place on the eve of May Day. It is a festival that combines the influences of Saint Walpurgis' Day celebrations which welcome in the spring, International Labour Day, and the traditional springtime revelry of Scandinavian students. Old photographs reveal that people have been gathering around the Market Place fountain to celebrate with balloons since the 1930s. High-school graduates traditionally wear white, peaked caps while they party through the night of April 30th and into the following day. Legend says that Havis Amanda received her first own cap as early as the 1920s. It then became somewhat of a tradition, which is still alive today. Annually, a group of delegated higher education students place a cap on the top of her curly locks. Until the 1970s, this 'capping' ritual, which is preceded by the bathing or 'foaming' of Havis Amanda, took place in the middle of the night to mark the beginning of the Vappu Day. Due to the event's great popularity it nowadays starts earlier at 6pm. Not even in 1990, when for safety reasons climbing the monument was banned, was this ritual interrupted. Thus, tradition holds and Havis Amanda continues to receive her cap each year - though nowadays it is passed over and placed on her curly locks from a crane! The work of art belongs to the collection of HAM Helsinki Art Museum.